I thought it was really fun and very interactive - also quite an exciting start to a busy day. Andrea was great! .. S. M.
Loved it. It was great to see our staff come out of their shell. We now have our own inside joke for the retreat....vedy good vedy good yea! .. R.S. I thought it was wonderful and have no suggestions whatsoever on how to improve it. .. S. C.
Although from my wheelchair I could not participate in all of the "laughter yoga" I enjoyed it alot. It was very invigorating and allowed me to move certain muscles that I haven't moved in awhile. Andrea is very good at getting people involved. .. J. M.
Andrea has been a vital source of support and inspiration for me. She has an astute understanding of how people work internally and a compassionate way of helping them understand themselves. She is spiritual and genuine, using her own challenges and continual growth as she gets people engaged in the full range of human experience from silly and outrageous to deeply emotional and connected. I always feel better after I've gotten to spend time with Andrea! Laughter yoga is a physically oriented technique that uses a perfect blend of playful empowering and tension releasing laughter exercises. These are interspersed with gentle breathing and yogic stretches, rhythmic clapping and chanting of hohohahaha. 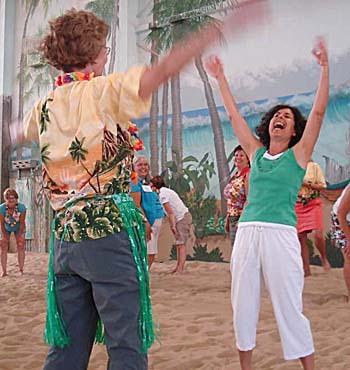 Madan and Madhuri Kataria, a physician and yoga teacher couple, in Mumbai, India in 1995, created laughter yoga. There are now over 5,000 laughter clubs all over the world. Dr. Kataria’s vision is to bring peace to the planet one laugh at a time. DENVER LAUGHTER CLUB: Sharing laughter within a group gives people a deeper sense of connection and transcends barriers. I lead laughter yoga at the Denver Laughter Club, which meets every Monday at noon at the First Unitarian Church, 1400 Lafayette St., Denver. I lead once a month. 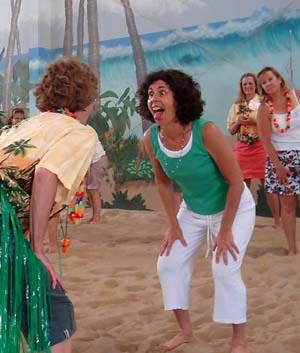 LAUGHTER YOGA FOR GROUPS: I also offer laughter yoga seminars for businesses and groups. It is a great icebreaker and a perfect opening experience for workshops, conferences or training sessions. Laughter yoga has many benefits besides the joy of laughter. It combats negative effects of stress. It is a powerful antidote to depression and anxiety. It is aerobic and a great massage for the internal organs. It improves people’s sense of humor, self-confidence and communication.